Hola Unblocker is a stand-alone program which supports all browsers. Specifically, Hole Unblocker is a tool which helps you access content which may be region-locked to countries in which it is produced. With Hola Unblocker, you can theoretically access online video services like Hulu, Netflix, CBS, Fox and others which are normally only available to users in the United States. The same goes for other content from Canada, Australia and the United Kingdom. This application hooks you up to anonymous VPN/proxy services across the globe depending on where you would like to appear to be surfing from. Hola Unblocker has become rather successful among Chrome users, but is also compatible with other browsers. The file offered here works with all online services and operates independently of the browser. Note: There are also separate installations available as browser-specific plugins for Chrome and Firefox. 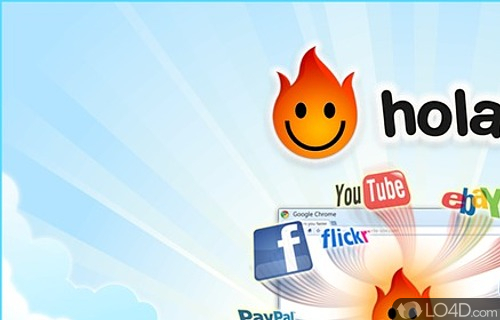 Hola Better Internet can hide your true IP address and circumvent state censorship. Hola Unblocker is licensed as freeware for the Windows (32-bit and 64-bit) operating system / platform from anonymous proxy software without restrictions. Hola Unblocker 1.131.311 is available to all software users as a free download (Freeware). Compatibility with this software may vary, but will generally run fine under Microsoft Windows 10, 8, 8.1, 7, Vista and XP on either a 32-bit or 64-bit setup. A separate x64 version of Hola Better Internet may be available from Hola Networks Ltd. This download is distributed as Hola-Setup-1.131.311.exe and Hola-Setup-x64-1.131.311.exe. 4.3 out of 5 based on 41 ratings.